A possible triangular UFO over Tucumán, Argentina? Contributing editor Guillermo Gimenez provides us the following photo from Luis Burgos's FAO site. 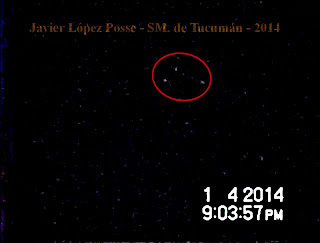 The image, taken by Javier Lopez Posse, is accompanied by the following text: "Attention, Tucumán! Today at 09:03 p.m. I captured three white lights in the shape of a triangle (possible triangualr UFO) flying from East to West at a 60-degree elevation. I was looking at it from North to South, apparently heading toward Cerro San Javier. It gave the impression of being translucent, with white yet opaque lights. If anyone else saw or recorded it, please advise me privately."